Thank you for your great response to last week's video on my ten-item wardrobe for spring. It's already had thousands of views on YouTube and I received dozens of messages on the subject. One reader wrote to me with concerns about the cost of clothing. Remember the ten-item wardrobe is achievable on any budget. Let's say, for example, you've decided to add an A-line skirt to your ten-item wardrobe. You could find a skirt that costs $35 as easily as one that costs $100 or more. In the video, I showed you my wardrobe which is very personal to me. Some of the items were new and many I've had for years. Because I buy less clothing, I am able to afford higher quality clothes. Last week, Catherine Duchess of Cambridge wore a Top Shop dress to an official engagement. She looks elegant in everything she wears, no matter how expensive or inexpensive. You must do the homework to find the brands you love that fit into your budget. It is a fun sort of research so enjoy it! In fact, the whole process should be fun and liberating. I really enjoyed this blog post by Eleanor of Ballyhoo & Bedbugs. After reading Lessons from Madame Chic she decided to pare down her wardrobe (not to ten items but it's a start!) and she has fun in the process. That's what it's all about! I hope you have a lovely week and I will see you soon! It's finally here! My ten-item wardrobe video for spring 2013. I wanted to do something a little different this time so the video presents a fashion show. The ten-item wardrobe is all about having fun with fashion and freeing yourself from a confused closet packed with too many clothes. If ten core items are not enough for you, boost it up to fifteen or even twenty. Just do what works for you. I'm sticking to ten (or eleven as you will see in the video) to show you how it can be done but if you need more blouses, for example, then add them in. You know if you are going overboard with shopping/ hoarding clothes. Just do a gut check with yourself and see if you have more items than you need. As far as extras go, I really only show tee shirts in this video. I don't show cocktail dresses, cardigans, etc. I just wanted to show you the bare essentials for an everyday wardrobe. Also, you will note that most of my shoes in the video are by London Sole... Many of you already know the reason why this is but for those who don't, the mystery is revealed in the video! Some items are new and available now in stores, some items I've had for years (you will probably recognize a few). Here are a list of the websites for all of the brands featured. All of the clothes in this video were purchased by me. I have no affiliation with any of these brands (other than our beloved London Sole). I would love to know... what will your ten-item wardrobe look like this spring? **The music in this video is composed by me. 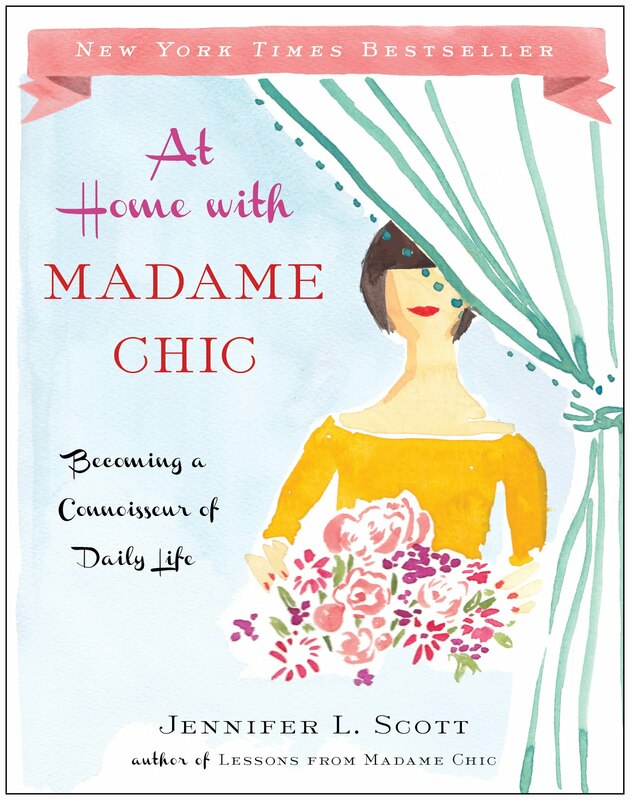 ♥ If you are new to the blog and want to get a more in-depth insight into the ten-item wardrobe, check out my book, Lessons from Madame Chic. ♥ For even more on the ten-item wardrobe, pick up the latest issue of Darling Magazine where I've written an original piece accompanied by a European photo shoot! P.S. This magazine is amazing. It is full of really thought provoking articles on what it means to be a woman. I recently came across some pictures of my great-grandparents that dated all the way from 1908 to 1944. I am completely mesmerized by them and marvel at how my ancestors lived in such a different way than we do now. One thing I took note of: both my grandmother and great-grandmother looked so presentable and put together, from their hair to their shoes. Some pictures were special occasion shots but others were candid shots of them taken on a normal day. They looked presentable everyday. Boy how times have changed! ♥ The hilarious Bill Leff of WGN radio interviewed me last week on my Eliza Dolittle moments in Paris. You can listen to our interview here. ♥ Erin Gates of Elements of Style blog picks her own version of a ten-item wardrobe and reviews Lessons from Madame Chic in her Fashion Friday post. ♥ Sewing Artistry writes: Madame Chic Has A New Fan!!! Moi!! 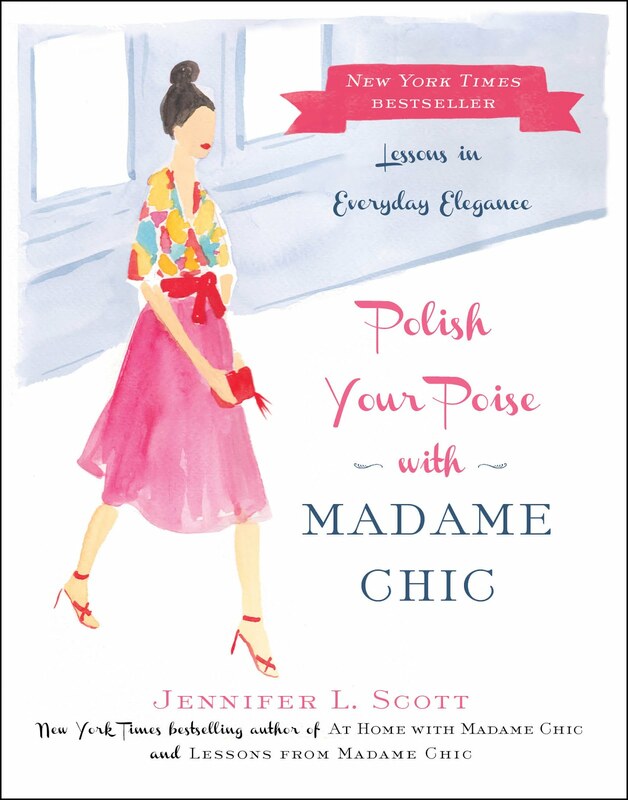 ♥ Write in Seattle writes an article called, From blog to book: The delicious "Lessons from Madame Chic". ♥ Laura Gail Claassen of The Chic Planner writes about her own experience with the ten-item wardrobe. ♥ Claire from the Land of Lorp explores her own spring uniform inspired by Lessons from Madame Chic. One of the most heavily requested videos I get is, how do we care for ourselves as busy moms? I'm right in the thick of it, as you know, with a baby and a toddler. With regard to self care during this time I am certainly learning a lot. I've learned that I have to take a holistic approach to caring for myself and that it's the small moments and simple pleasures that really matter. I'm learning along with all of you and I have so much to say! (You'll note that this week's video is 7 minutes long.) Even when we do our best to take care of ourselves things don't always go our way. I've spent the last ten days battling the most miserable cold (so much for my spring break!). Everyday I adapt. I've gone to bed at 7:30pm, cancelled social engagements and finally went to the doctor. Watch this week's video to hear how I get through my day with care and style. (And truly this video is not just for busy moms but all of us, really, who would like to find balance in life.) If you are unable to see the embedded video, click here, look in the sidebar of this blog, or visit my channel: www.youtube.com/TheDailyConnoisseur. This week I would love to know... how do you care for yourself? 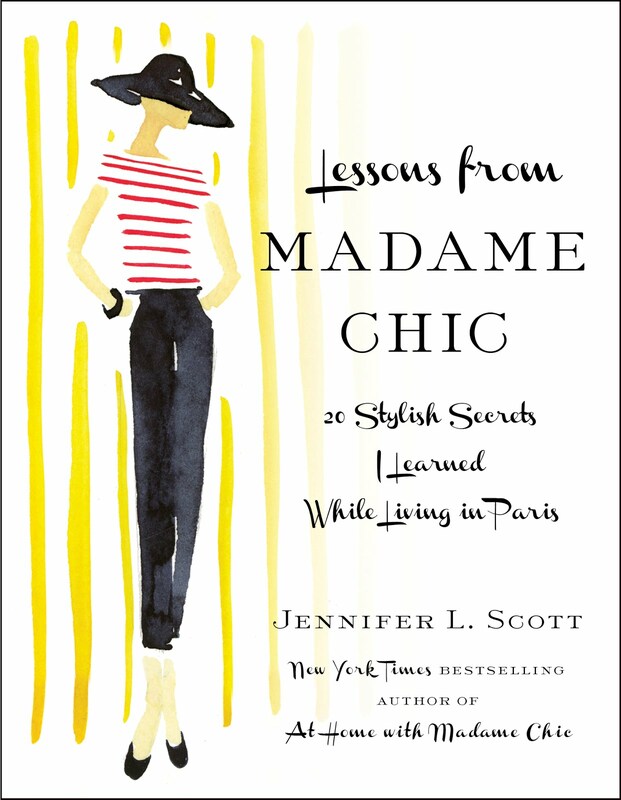 ♥ Marilyn of Two Frugal Fairfielders reviews Lessons from Madame Chic. She says it's "one of the best little books I've ever read". ♥ Marla Malcolm Beck, co-founder of Bluemercury, reviewed Lessons from Madame Chic on her blog and even tried out le no makeup look for herself! ♥ My interview last Wednesday with Cindy Laverty on Women 4 Women Network radio did not air due to technical difficulties, but it will air this Wednesday, April 10th at 10am PST. 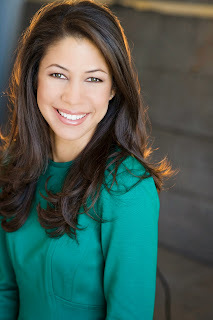 Visit www.W4WN.com or click here to listen to our interview where we discuss how we can CARE for ourselves as busy women. ♥ This Wednesday evening, April 10th, I'll be a guest on Bill Leff's late night radio show on WGN Chicago (radio 720). Check out his website for more details. ♥ Because of my cold I have not yet shot my spring ten-item wardrobe video. It's coming soon, I promise. You've probably already noticed some new pieces I'm wearing in my videos... it's coming! Next week will discuss looking presentable while raising small children. See you then! ♥ And finally, I would like to dedicate this blog post to Roger Ebert, the legendary film critic who passed away last week. I grew up watching Siskel and Ebert's weekly show. Their intelligent, yet approachable reviews got the entire nation excited to become film connoisseurs. If I was ever curious about a movie, I would always go to Roger Ebert's website first to see what he had to say. I'm a bit at a loss as to what I'll do now. He will be greatly missed.